Introduced to North America from Europe in 1868 by settlers as food and medicine. What problems does Garlic mustard cause? Like most invasive plants on the Top 20 list for the region, garlic mustard replaces native plants in high quality natural areas, which in turn reduces critical food resources for birds, butterflies, and other wildlife. In addition to physically crowding out native plants—especially spring ephemerals like trillium and violets—garlic mustard releases chemicals into the soil that hinder the growth of other plants. Furthermore, few native herbivores will eat garlic mustard, giving it a large competitive advantage over native plants. 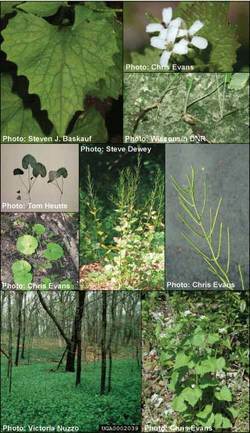 The replacement of native plants by garlic mustard can hinder forest regeneration by limiting tree seedling growth. Garlic mustard seeds are able to live in the soil for at least 7 years before sprouting. What does Garlic mustard look like? Garlic mustard is a biennial herb that usually grows to 2 to 3 feet when mature, though it spends its first growing season and the following winter as a small leafy rosette. Leaves are triangular or heart-shaped, and are roughly and irregularly toothed. The second year stem is topped by clusters of small, white, 4-petaled flowers. All parts of the plant smell of garlic when crushed, especially early in the season. Adult plants die in midsummer, but persist as tall dead stalks with thin seed pods. Although tolerating a range of conditions, garlic mustard is most common in moist forest edges, open woods, and shaded roadsides. How do I manage Garlic mustard? Pulling garlic mustard is very effective in small populations. Take care to remove the root, and pulling should be done in early spring, before the plant goes to seed. Garlic mustard is an extremely hardy plant, and can re-sprout in a compost pile or if left out, and seeds can develop even if the plant was not flowering when pulled. Bag pulled plants, and send them to the landfill; this PDF explores a lot of garlic mustard disposal options, including landfill, animal feed, and human consumption! Larger populations may be managed through herbicide use; spraying is best done in early spring and late fall, when garlic mustard is one of the few green things, so there is little risk to native plants. ISN hosts "workbees" to remove invasive garlic mustard every May! ​Check out our Events Page to find the one nearest you.